When you visit the optician for your eye health check you may not know what to expect, especially if it’s your first appointment or you haven’t had a check-up for a while. It’s understandable that this might make you a little apprehensive but at Ralph Carr Opticians you’ll only ever receive the highest level of service from our experienced and reassuring team. Our experienced team will guide you through all stages of your 30 minute eye health check. Whether you are a new face or one of our many loyal patients, we will always tailor your eye health check to suit your personal needs. In order to create an eye examination for you, we will need some information about your requirements, eye and family history. The answers you provide will then inform us of the best ways to check your visual acuity, prescription and overall eye health. Additionally, retinal photography and video slit lamp are enhanced ways in which we can assess the health of your eyes. You can choose from a private or NHS test when you visit Ralph Carr Opticians. Private eye examinations cost £33 for standard health check, and £37 for premium health check. Do you suffer from diabetes? 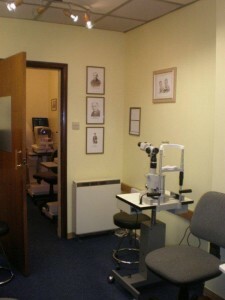 At Ralph Carr Opticians we are part of the Diabetic Retinopathy Screening Service. Diabetic retinopathy is a common complication of diabetes where high blood sugar levels can damage the blood vessels in the eye. If left untreated, this can eventually cause blindness. If you have diabetes, you are entitled to participate in this screening process to evaluate any effect on your eyes and manage it appropriately, if necessary. In addition, you will also be able to take advantage of our glaucoma screening tests and visual field tests to determine any indication of glaucoma development. If you suffer from dry eye, you’ll find that your eyes are often red, sore and irritated due to a lack of sufficient lubrication. We are qualified to carry out punctual plug assessments and fittings, which can considerably improve these symptoms. Punctual plugs are inserted into the tear duct to prevent liquid drainage from the eye and therefore relieve uncomfortable symptoms. More information on punctual plugs is available here. For more information on diabetic retinopathy screening, glaucoma screening, punctual plug assessments or to book an eye health check, please give us a call on 01744 23955.